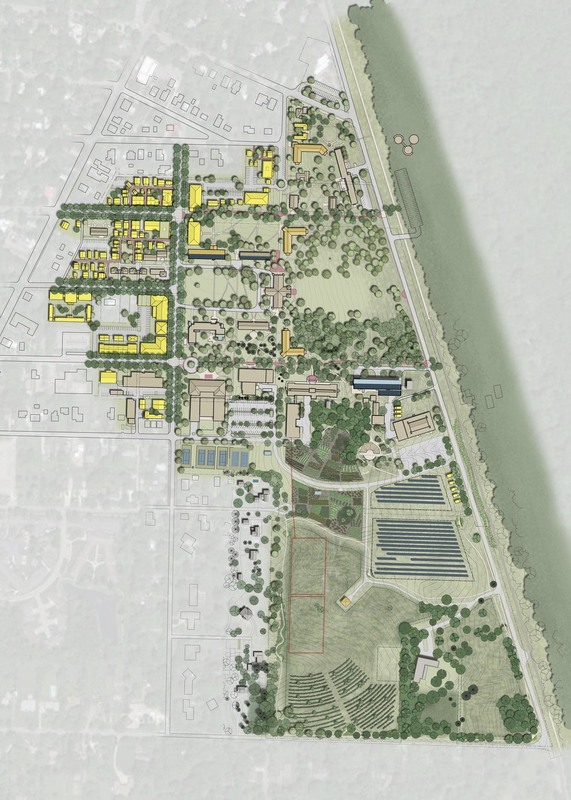 Antioch College is considering developing a new multigenerational housing community on its campus, preliminarily called Antioch College Village (ACV). The idea emerged as the College has grappled with the future of its educational mission and its need to find a model for fiscal sustainability. Utilizing the College’s land and other physical resources, the concept is designed to support a community of lifelong learners who also help to support the College. Residences will be physically woven into the fabric of the college campus and residents will have access to the College’s educational and cultural resources. ACV is also conceived as a paradigm of environmentally responsible living. Sandy Wiggins of Consilience, LLC led the planning effort; Dover, Kohl & Partners led urban design for the site and facilitated a public design charrette. Also involved in this planning effort are Biohabitats (water and ecology) and Integral Group (energy). Charrette participants expressed the desire for a greater variety of housing in Yellow Springs. A more diverse stock of housing options would better accommodate residents of all ages. Citizens also communicated a desire for housing designed and oriented to facilitate walking and biking to daily destinations. The resulting vision and plan has a combination of small buildings and larger ones, mid-block green spaces and small intimate walkaways. On the periphery where the College meets the Village of Yellow Springs, buildings are small and detached, a scale similar to surrounding single-family homes. Approaching Livermore, buildings become more attached and of a larger scale, compatible to existing campus structures. 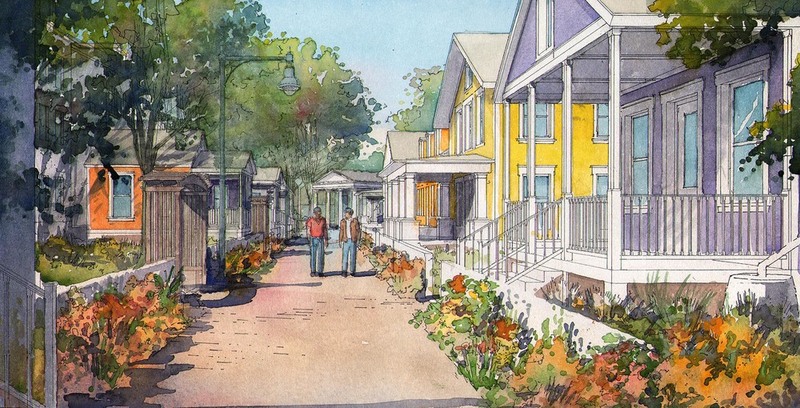 The back-and-forth coordination between architecture and urbanism throughout the charrette week resulted in overall plan concepts that include some larger buildings, which can help to reinforce the main axis on Livermore Street, as well as tiny houses, that can add diversity and interest within the same block. A series of building types, ranging from large-home apartments to tiny houses, were created for the infill properties that were identified on the plan. Each type has a distinct character and size, and can also have a different leasing arrangement.